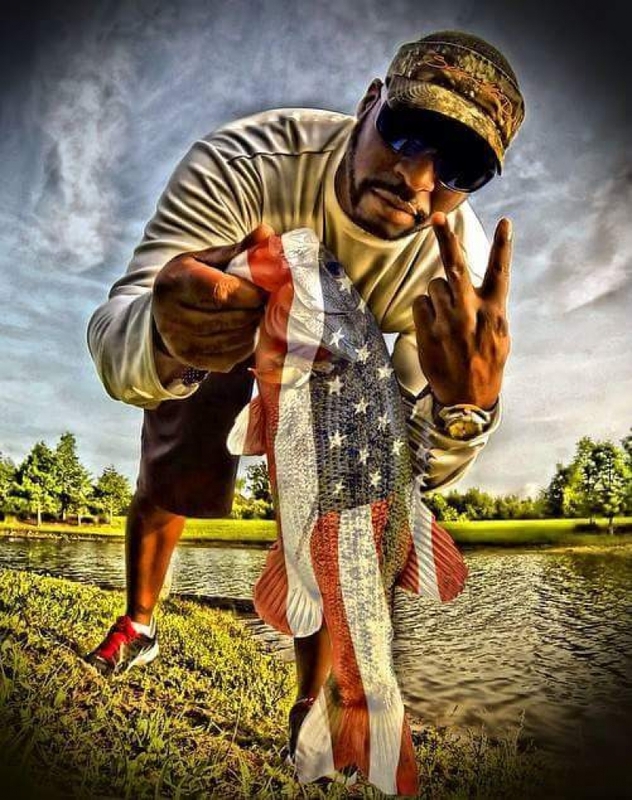 This long weekend is Memorial Day and to pay tribute to those that have served overseas, we had a chance to chat with our own Rod Glove Pro Staff, J.B. Bassmaster. We all know him through the various types of social media as J.B. Bassmaster and we watch daily as he shows us some pretty huge large mouth bass through Facebook, and Instagram. J.B. is from Florida and grew up fishing with his Grandfather all over the state. His fishing was interrupted once he joined the U.S. Army and served overseas in The Gulf War and Operation Desert Storm. After having two knee surgeries from injuries sustained overseas, he was released from active duty. This allowed J.B. the chance to get back to his roots of fishing. He has been fortunate to be self employed and during the day, J.B. works hard detailing, power washing and acting as a personal assistant to many high end clients. These clients own lakes, ponds on their personal property and it is through this access that he is able to fulfill his passion and to get on some of the larger sized bass fish. He says "that he has access to over 30 private lakes and ponds through his long time customers, that have become more like family". When we see what appears to be private property, it is indeed one of the many places in Florida that he has access to fish at. J.B. has been competitively fishing for a number of years now and is a co-angler in the BFL Series, ABA Ram Open Series. He does have plans on moving up to become an angler and to own his own boat once his family has been raised. He enjoys the position of co-angler as it allows him the opportunity to not only get out to compete in tournaments but he has also made some great friendships along the way. He has had the opportunity to learn from his fellow competitors and through sharing of information, it has improved his fishing exponentially. At the time of this writing, J.B. Bassmaster was about to head out fishing for the day. His motto is Fish Harder and we wish him great success as he transitions to become an angler in the next few years. As a co-angler, there is no access to a rod locker and there is a lot of bouncing around. With the Rod Glove Pro Series, the neoprene is very soft and I haven't lost an eye on any of my rods. I can not imagine putting as many rods in the rod lockers as you do with the Rod Gloves on, and both rod lockers have Rod Gloves. I use the same Rod Gloves on the same rods and I know in a hurry which rod to grab during a tournament. Years ago, my rods were tangled, and my eyelets were broken as they did not have any protection back then.